DAKAR, Oct 2 2012 (IPS) - In the midst of the building frenzy in Senegal, the construction of buildings that cost less than 60,000 dollars, and thus do not require a building permit, is going unchecked by authorities, resulting in the haphazard and unsafe construction of a majority of homes. According to the Centre for Affordable Housing Finance in Africa (CAHF), buildings that cost less than 60,000 dollars (30 million FCFA) do not require a building permit in this West African nation. And while these lower-cost buildings have to adhere to building codes, they are apparently not monitored. By law, every house or building built has to be monitored by inspectors for the potential violation of construction codes. 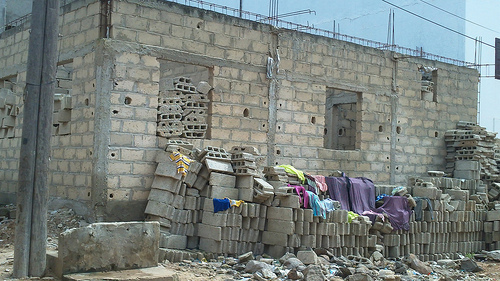 Recent torrential rains have exposed the downside of this unchecked growth in the capital city Dakar. Over the past two months rain transformed streets and main roads into lakes and rivers, and submerged townhouses, buildings, cars, crops, animals, furniture and infrastructure, while causing 18 deaths. The Global Facility for Disaster Reduction and Recovery said in its April 2011 report that Senegal’s rapid urbanisation of 3.3 percent has caused an explosion of buildings and roads that have reduced the infiltration capacity of the soil and exacerbated the impacts of floods. The Senegalese capital, a high-risk flood zone, saw 156 millimetres of rainfall in a two-hour window on Aug. 26, something that had not been seen in 30 years, the national meteorological office reported. The rains in August and early September have left 35,000 families homeless and directly affected more than 400,000 people nationwide, according to government figures. No investigation has so far been conducted to find out whether the collapsed homes failed to adhere to the country’s building code. Prime Minister Abdoul Mbaye quickly pointed fingers at people who build homes without abiding by the construction codes, promising to take “strong measures” against any violations of the building codes in the future. He has yet to say what those measures will be. Senegal’s current demand for housing stands at 200,000 homes, with an annual increase of 10 percent, CAHF says in its 2011 Yearbook on housing finance. The South Africa-based organisation says constraints on Senegal’s housing supply include limited availability of land, lack of formal market players, high cost of construction policies and limited availability of financial products. Dakar’s building frenzy may have been triggered by what CAHF says is the growth and boom of many African cities, as the continent continues to experience the highest urbanisation rates in the world. Over a third of Africa’s one billion people currently live in urban areas, but that proportion will have risen to half by 2030, according to the United Nations Human Settlements Programme (UN-HABITAT). It also lists Senegal’s capital Dakar as sixth among the 18 African cities that have experienced the highest rates of growth. The size of households in Dakar has been increasing rapidly since 2009. The average household size in Dakar in 2009 was 9.6 people, strikingly larger than in Nairobi (3.0) and Johannesburg (3.7), the Africa Infrastructure Country Diagnostic says in its 2009 report. The city is home to some 2.5 million of Senegal’s 12.7 million people, and the country’s average annual urban population growth rate is expected to be 3.4 percent between 2010 and 2030, according to the U.N. Population Fund. Rust told IPS that the increased demand in housing is likely to be primarily households that cannot afford a developer-built house, because 60 percent of the population earns less than two dollars per day. One man interviewed at a construction site in Guediawaye, a suburb in Dakar, said he knew nothing of the country’s construction codes. A building inspector who spoke on condition of anonymity said the state lacks the capacity and resources to send inspectors to patrol all areas. “We can’t be everywhere, how many are we and what means do we have? There is also the issue of corruption,” he said. Senegal was ranked 112 out of 182 countries in the Transparency International 2011 Corruption Perceptions Index. In West Africa, Cape Verde is the least corrupt country, while Guinea is the most corrupt, TI reported in 2011. Khoudia Mbaye Seydi, minister of housing and town planning, recently admitted that the state lacked the human and financial resources to exercise strict monitoring in the building sector. “This lack of means is a recurring problem,” she said, adding that 30 building sites in the western city of Kaolack have been closed down due to a lack of building permits. Rust also regrets that rapid urbanisation since the 1970s was not well managed. New entrants to Dakar settled on the flood plains, which due to the drought of the 1970s and 1980s looked like land that could be settled without risk. Due to Dakar’s inexistent and insufficient drainage infrastructure in many areas, lakes of rainwater stay in the streets and roads for several weeks or months before being dried up by the sun. This puts people at risk of contracting malaria and cholera. “It seems that the city would need to develop an urgent masterplan to address the flood situation – whether with improved drainage or other measures – and then provide support to low-income households to build housing that can withstand the environmental risks of the area,” she said.